Take a Look we did their website and logo. 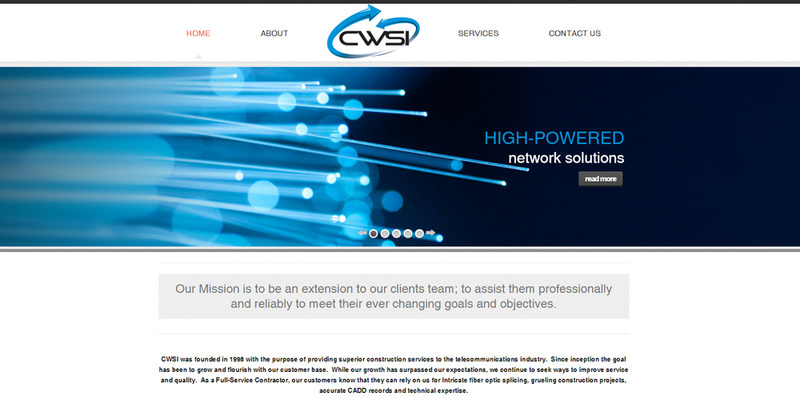 CWSI is the company that installs Data Communication Systems, Cabling and Fiber Optics for just about everyone who has anything to do with Data Communications in Florida. And they do a lot underground, although it’s all above ground. We like to think of it as underground branding. With their long history of reliable and reputable service, CWSI needed a marketing reboot to renew their image in order to meet today’s new visual and their industries’ standards. The head honchos down at CWSI understand that a distinguished, original, and professionally done Logo is a necessity. The memory hook and face of a business, is most essential for a lucrative business. Lacking such a crucial asset, would not only immediately lower, a could-be customers confidence in a business’s work, but it would compel “A Said Customer” to get the impression that the company does not care about the way their business presents itself. Which would indicate that the business does not care about the quality of their work or the way that their work reflects upon their business and its customers. When you are thriving for your business’s success, a logo helps grant your business visibility, credibility, and memorability – three components that will help your business to grow and achieve success. This is also gravely dire when it comes to the visual age of a companies branding. A strong history is an immensely important asset to any sector of a company. The last thing a business person wants are out of date designs that instantly turn away customers especially when your talking about an high tech company like CWSI. We here at Cimetta Design Inc. are wizards at giving new life to a business’ public image no matter the size of the company.